Prices start at $270 Per PersonGolf Package Includes Accommodations, Green Fees, Cart Fees and All Taxes. Play all 4 of the Big Cat golf courses Lions Paw, Leopard's Chase, and Panther's Run Golf Courses and pay for only 3. Tigers Eye Golf Links is FREE! This ferocious foursome is conveniently located in beautiful Sunset Beach, NC a sparkling jewel of the South Brunswick Islands. 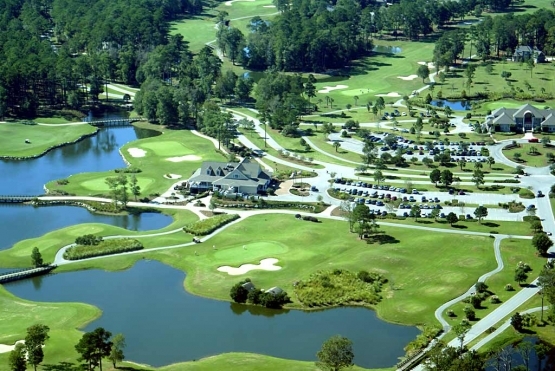 These golf courses courses are located just minutes from North Myrtle Beach, SC. at Ocean Ridge Golf Plantationwhich offers access to 72 holes of premier golf. See what the "ROAR" is all about. Lunch is available at all 4 courses when playing this 4 round special. *This Myrtle Beach golf package price starts at $270 per person with quad occupancy. With over 100 golf courses sprawling across the Grand Strand (including NC), you won’t have to travel far during your golf vacation to find play the courses that you’ve picked for your Myrtle Beach Golf Package. The North Carolina golf courses feature lush fairways, natural sand and water hazards and sophisticated level of service that sets a new standard in Myrtle Beach golf packages. Never far away are popular amusements, entertainment venues, fun attractions and a wide variety of dining options to round out your Myrtle Beach golf package. The courses you play in your Myrtle Beach golf package will challenge your skills, and hopefully improve your game. Be sure to include a visit to North Carolina to play the wonderful courses located just a few minutes north of the Grand Strand, as is in the Big Cats Myrtle Beach Golf Package. 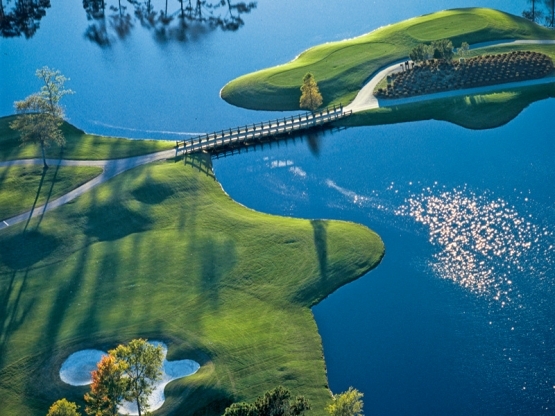 The Myrtle Beach area consistently has several courses ranked in the top 100 courses as rated by Golf Digest annually. Select a championship course, pick your tee times and don’t forget your clubs because with millions of rounds of golf played each year along the Grand Strand, Myrtle Beach is a golfer’s paradise. Get your group together and decide what courses to include in your next Myrtle Beach golf package, and know that any course that you choose is sure to please and offer many memories to take back home. Our golf specialists are happy to help, just give us a call. Lions Paw Golf Links – a Tim Cate design, Lions Paw is a links style course with MiniVerde ultra-dwarf greens. The layout is fairly long at 6,457 yards from the white tees and demands precision with the driver as native pine forests, swampland, and environmentally sensitive areas can swallow errant shots. Panthers Run Golf Links - One of the four amazing “Big Cats” courses at Ocean Ridge Plantation in Ocean Island Beach, NC, Panther’s Run features wide fairways to create some extraordinary vistas. As are the other Ocean Ridge courses – Lion’s Paw and Tiger’s Eye and Leopard’s Chase – Panther’s Run is a Tim Cate design that will test your ability to blend precision with distance. The course opened in 1994, and in 2010 the putting surfaces at Panther’s Run Golf Links were converted to MiniVerde™ ultra-dwarf greens, which offers an unmatched combination of smooth, consistent playability and disease-resistant, heat-tolerant durability. Tigers Eye Golf Links – One of Tim Cate’s greatest creations. Tigers Eye is a thinking man’s course, requiring precision shot making and a reliable short game. If the course itself isn’t enough, Tiger’s Eye is home to a beautiful stand-alone clubhouse that offers a panoramic views of the course’s 9th, 10th and 18th holes. Leopard’s Chase Golf Club - which opened in 2007, is the second youngest golf course in the Myrtle Beach area, This Tim Cate design was ranked among the top 10 new courses in America by Golf Digest and Golf Magazine, Golfweek has ranked it among the top 5 public courses in North Carolina, and Golf World readers once voted it among the top 50 courses in America. The par 4 18th hole, which features a beach bunker and green-side waterfall. It’s an unforgettable finish.But golfers are dazzled long before they arrive at the final hole. The island green fourth hole provides take-home memories, and both par 5s on the back – 11 and 14 are outstanding. 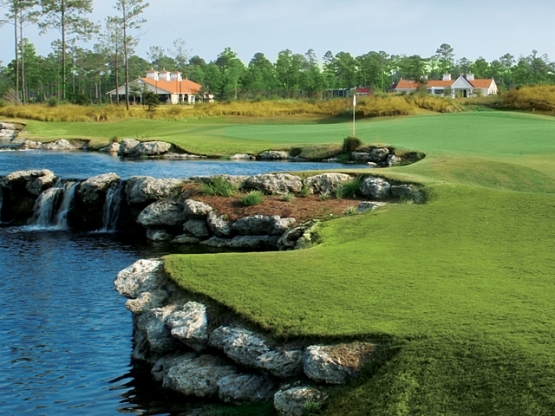 Leopard’s Chase Golf Links, with its L93 bentgrass greens, is a premier layout. Just avoid the sand!